Creative Medical ID Alert Bracelets and stylish jewelry custom engraved for men, women, children - Hearts Embrace silver crystal interchangeable alert bracelet. 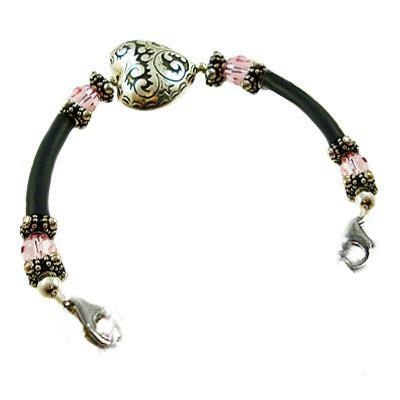 Let your heart shine through when casual style meets glamour with our siliver plated filigree heart, black rubber tubing and 6mm Swarovski crystal bracelet. This bracelet adds the perfect touch of individuality to your everyday wardrobe. Pick your favorite crystal color! Bracelet shown in Light Pink.